Hi there, my darlings!! I am so excited about today's giveaway! I am so thrilled with how my blogaversary customs from Joanne of Daphine Polish turned out and oh my! The names KILL me! They're so perfect! I can't wait another minute to show you!! 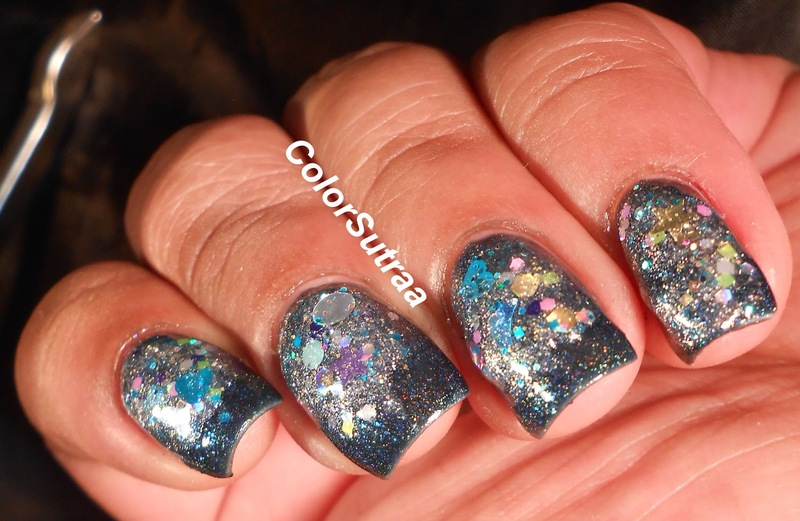 Buffet Pants is a GORGEOUS navy blue jelly polish with a strong linear holographic finish and added gold micro flakies! Both the application and formula on this polish was fantastic--I used 3 smooth coats by itself for the swatches below! Isn't this utterly beautiful!? Squee! I LOVE how the gold flakies add an extra dimension of pretty to an already fabulous holo! All-You-Can-Eat is a true glitterbomb--a clear topcoat filled with tons of shimmers and packed with glitters in all shapes and sizes, including stars, hearts and large holo circles! You just never know what each brushstroke will bring forth! No complaints at all with the formula or application--I didn't have to spend a ton of time fishing for glitter because I so don't have the patience for that! The swatches below show my attempt at a bit of a reverse gradient--2 coats of All-You-Can-Eat dabbed around the cuticle line and down towards the middle, over Buffet Pants. I love how this almost has a jewel-encrusted feel/look to it! So there you have it, my darlings!! 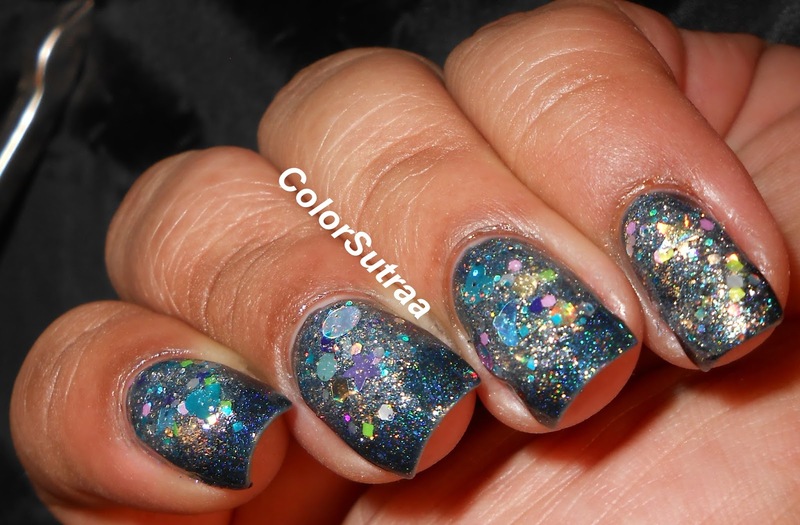 My custom polishes for my first blogaversary from Daphine Polish! Now these two polishes are exclusive to this giveaway but check out the other beauties in stock at Daphine Polish's Etsy shop HERE. Please follow Daphine Polish on FACEBOOK and on INSTAGRAM for all the latest updates and sneak peeks! I would love to hear what you think of my customs in the comments section below!